Above: Scaly leg mite can lead to lameness if left untreated. Scaly leg mites are parasites that are particularly associated with the feet and legs of chickens although they can also infest any unfeathered areas including the face, beak, ears, eyes, combs and wattles of other poultry. Left untreated the condition can be very painful, possibly causing the loss of toes, lameness and in the worst cases even death. Highly contagious, it is important that an infestation is correctly identified and treated as soon as possible to prevent it spreading. The tiny mites (knemidocoptes mutans) burrow under scales where they lay their eggs. As these hatch the proliferation of mites, eggs and droppings causes the scales to become raised and irritated. To add to the discomfort they will bite into the skin in order to feed from the ooze that seeps from the wounds. The mites are transmitted from bird to bird through prolonged and close contact so over crowding is a risk factor. Any new additions to the flock should be closely inspected before introducing them to your existing birds. 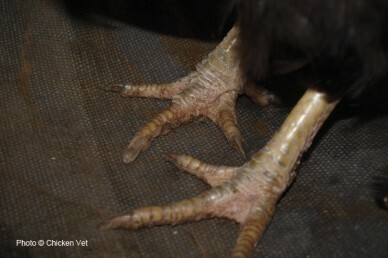 Chickens with feathered legs or feet are particularly vulnerable. Treatment for scaly leg mites is a two pronged attack. Firstly you will need to clean the legs with warm water to which you can add baby shampoo or tea tree oil which will start to kill off the mites. Use a soft brush, such as a pastry brush or small toothbrush, to gently remove build up from underneath the scales or alternatively try flushing with a syringe. Don’t however, be tempted to remove affected scales as this would be extremely painful and will not prevent or cure the condition. When cleaned dab the legs dry and coat with petroleum jelly or nappy rash cream to soften the scales and suffocate the mites. TIP: it may be easier to do this in the evening when the birds are more placid. Of course this is not the only method of treating the condition but it is the one we have found to be both effective and the least traumatic for the birds. 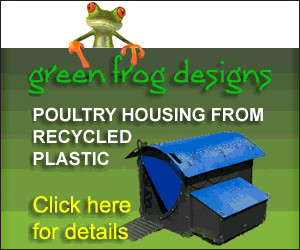 You should also thoroughly disinfect the coop and accessories and ensure that any litter is changed regularly for the first few weeks following an infestation. Scales can take up to a year to heal and completely regenerate although improvement should be seen quite quickly. If traditional treatments do not seem to be working there are insecticides available although we suggest veterinary advice should be sought as they may not be licensed for use in chickens and the eggs and meat my be subject to a period when they should not be eaten after use.